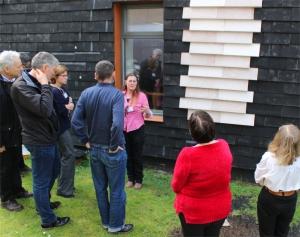 On a warm morning in April, delegates made their way to Brighton for a Sustainability Tour of the Waste House. This event was held as part of the Sustainable Business Partnership CIC’s ongoing Utilise Plus programme which helps small and medium sized enterprises to reduce their costs and Greenhouse Gas emissions by saving energy. 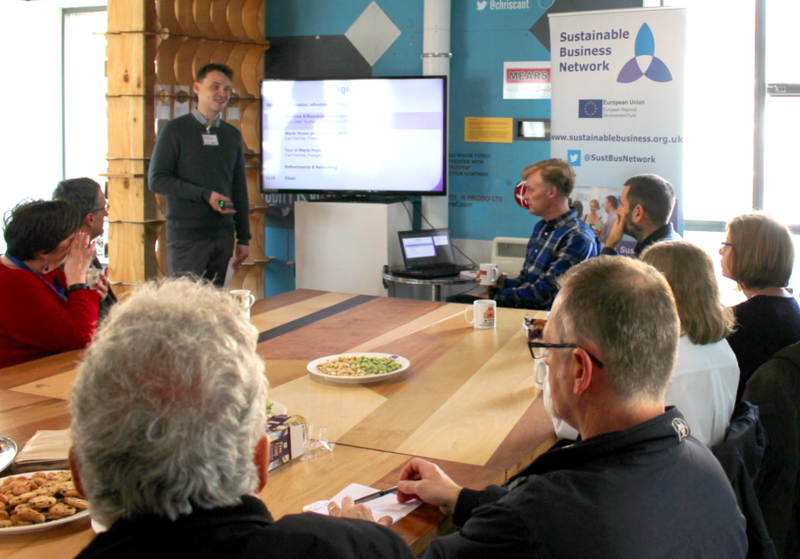 The SBP CIC’s Jack Dale welcomed delegates and went through the various services available through Utilise Plus, including fully-funded energy audits and a variety of events. Jack then handed over to Cat Fletcher who played a vital role in the Waste House’s construction. In addition to this, Cat also runs Freegle and consults Brighton and Hove City Council on re-using waste. In response to Cat’s ongoing work, The Guardian aptly dubbed her the ‘Resource Goddess’ in 2018. Designed by the University of Brighton’s Duncan Baker-Brown, the Waste House was Europe’s first public building to be built with waste and opened its doors in 2014. Cat explained that 600 million tonnes of new products and materials enter the UK economy each year. With less than 20% of this being recycled, Cat emphasised the need to prevent and minimise waste where possible and to reuse or recycle instead of sending it all to landfill or an incinerator. Cat appreciates that for many people recycling is seen as a chore. In contrast, re-using is a more holistic, social activity, with the Waste House embodying this. With help from students, professionals, apprentices, and volunteers, Cat explained how she sourced various ‘traditional’ building materials from construction sites and skips and combined them with unrecyclable and commonly discarded items, including 500 music cassettes, 2,000 floppy discs, 4,000 video tapes, and 19,800 toothbrushes! Using this innovative approach, items destined for landfill or incineration were instead repurposed. Now, the Waste House acts as a ‘living laboratory’ for ecological architectural design, with the building being used for various seminars and events. On the tour, delegates got to see this ‘waste’ in action! Cat showed us the different materials used to insulate the walls, from video tapes to toothbrushes. Around 2,000 carpet tiles from old office buildings were used to clad the house, as well as for flooring. Cat explained that building with materials like these can be a case of trial-and-error. For example, she initially wanted to use vinyl records to clad the house but was concerned they would melt in the sun. With materials constantly being sourced and re-used, there’s plenty of experimenting at the Waste House! This event was fully-funded by the European Regional Development Fund (ERDF). 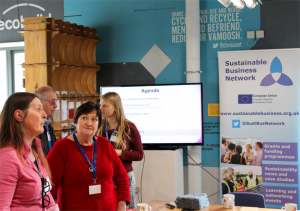 At the Sustainable Business Partnership CIC, we’re always keen to hear about exciting venues, passionate speakers, and enthusiastic event partners. If you’d like to work with us, please get in touch.